In full transparency, I don’t love actual s’mores. The individual ingredients, sure, but they’re just a hassle if we’re being honest. I mean, who has a campfire on standby and wants to get melted chocolate all over their hands? Nope. I’d much rather stuff all the ingredients into things like donuts, no bake protein bites, and protein pancakes. 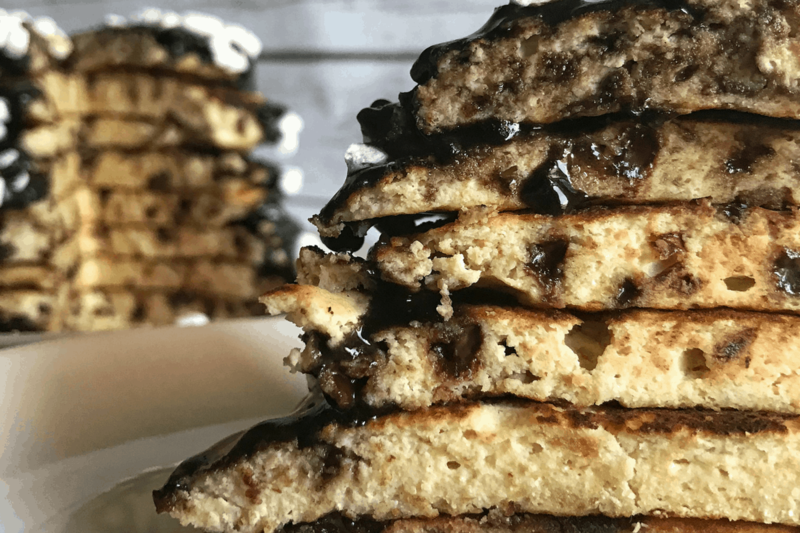 So, today we have s’mores protein pancakes with a 3-ingredient, high protein chocolate syrup. 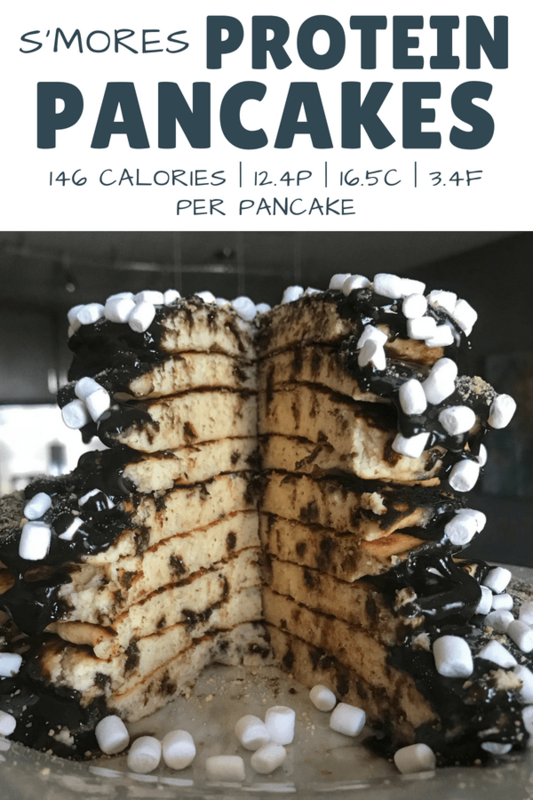 The recipe includes several modifications to fit your individual calorie needs, but at the lowest end of the spectrum, you can enjoy a chocolatey pancake for as few as 146 calories! As you can see, there’s not a huge difference on a per pancake basis. But if you’re going to eat more than one pancake and add frosting, be aware this can add up fast. You could always go half and half, using two whole eggs and half the egg whites. 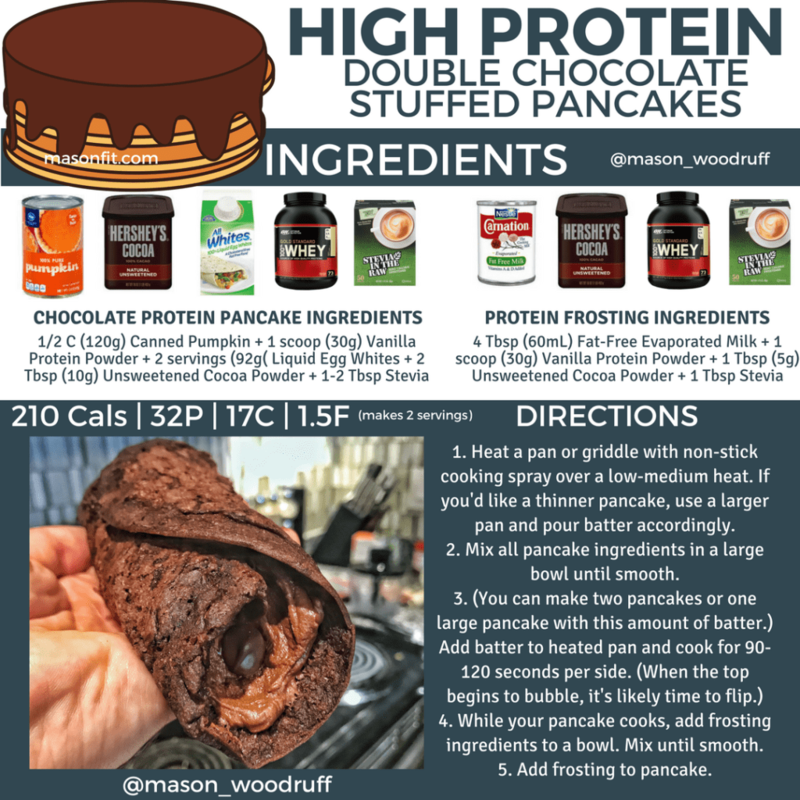 Or, you could substitute a bit of unsweetened apple sauce or pumpkin (like in my double chocolate protein pancakes below or the even tastier easy chocolate protein pancakes) for some of the eggs as a fat replacement. I know that’s a lot of options but don’t sweat it, you’ll love the base recipe with egg whites. If you’re interested in seeing all of my recipe graphics like the one above, check out my Healthy Snacks Guide next. There are over 30 recipe cards and 60+ snack ideas! A quick note on the marshmallows in the recipe. 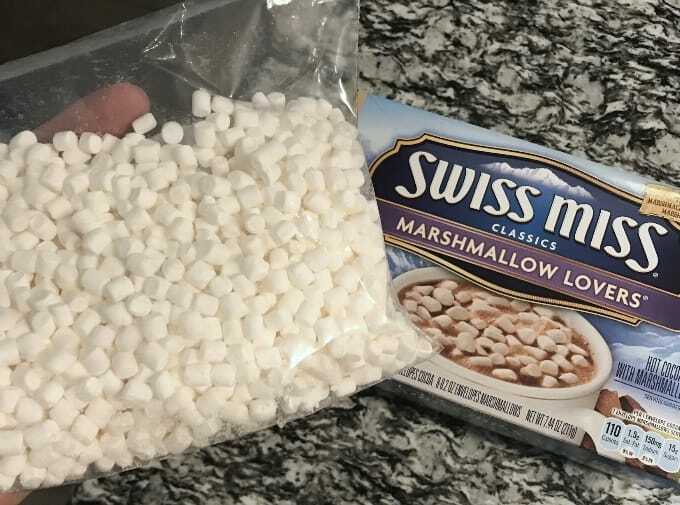 If you can’t find marshmallow bits in your grocery store, my girlfriend had the genius idea to buy Swiss Miss’s Marshmallow Lovers Hot Cocoa. The hot cocoa and marshmallow bits come in two separate packets, so you’re good to go. You can also use mini marshmallows and chop them into smaller pieces if you wanted. If you make this swap, exchange gram for gram. One of our base ingredients will be coconut flour, which is a unique ingredient in my mind. It’s super absorbent and fiber-rich. Meaning, you don’t need much of it to get the effects of flour. It also has a slight coconut taste to it without overpowering other ingredients, which I love. That said, it’s not as common. So if you would like to substitute all purpose flour for coconut flour, try using a 3:1 conversion (2:1 may work). In this recipe, instead of 1/2 C or 56g of coconut flour, you may need around 1 C or 120g of all purpose flour. This swap would definitely add some calories and carbs, so if you’d like to order coconut flour for future recipes, this is the flour I use. 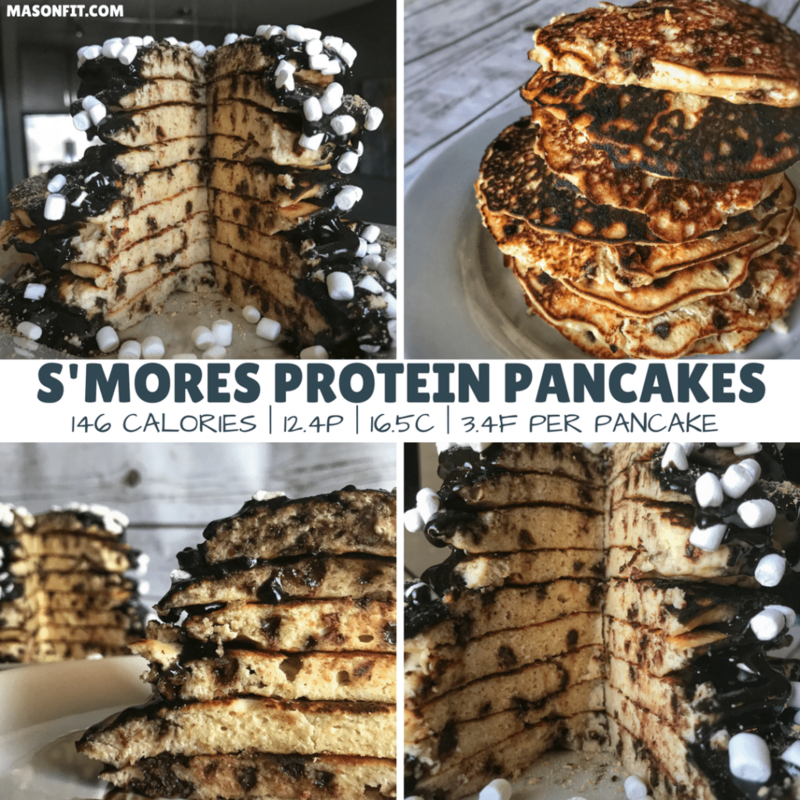 For these s’mores protein pancakes, I put a spin on my Ultimate Protein Frosting recipe. It’s super easy, and you’ll only need three ingredients. The only note I’ll add here is about the evaporated milk. Be sure to check out the label to ensure you’re buying one without a ton of added sugar. There are some fat-free evaporated milk products that have 50-100 calories for the same serving size. 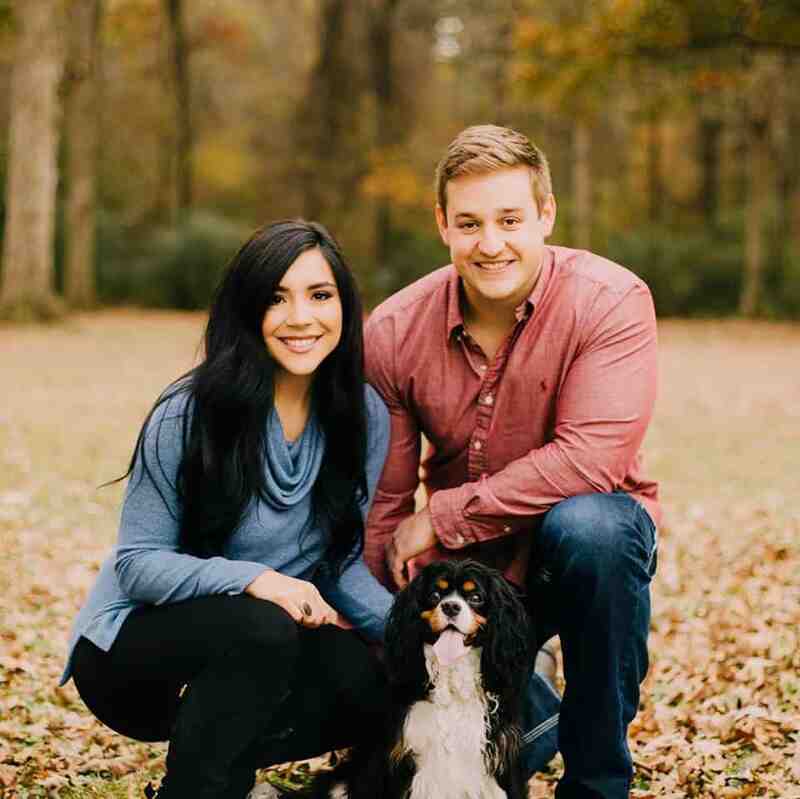 You can see the products I use in the photo below. 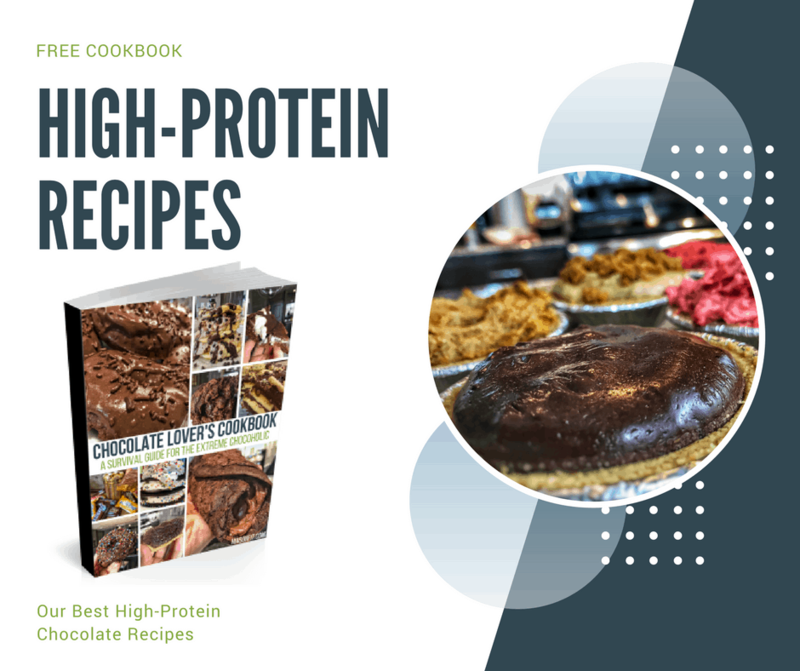 What Protein Powder Works Best for Recipes? Low calorie, high protein pancakes stuffed with real graham crackers, chocolate, and marshmallows. All covered in a high protein chocolate syrup. Mix dry ingredients in a large bowl before adding Greek yogurt, egg whites, and sticky sweetener (WF Pancake Syrup). Fold marshmallow bits and chocolate chips into the pancake batter last. Heat a large skillet (or two if you're in a hurry) over medium-high heat with nonstick cooking spray. Add your pancake batter to the heated pan(s). The batter should make 8 pancakes, around 5-6 inches in diameter. Portion accordingly. Cook for 3-5 minutes per side or until the bottoms are golden brown. At that point, flip and cook for an addition 1-2 minutes. After you've prepared your pancakes, plate them and begin mixing your chocolate syrup. For the syrup, mix evaporated milk, protein, and cocoa powder in a small bowl. If you'd like your chocolate syrup to be more like frosting, reduce the amount of evaporated milk to 1/4 C or 60mL. 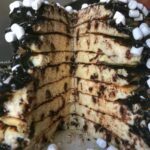 Optional toppings: chocolate chips, marshmallow bits, or more syrup. Enjoy! 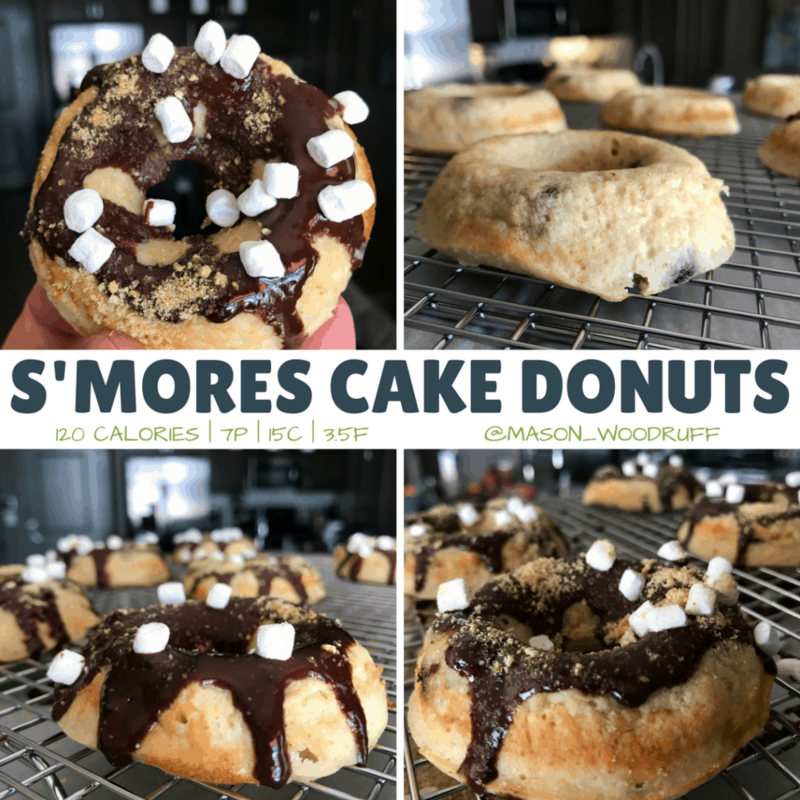 I mentioned my s’mores protein donuts in the intro and wanted to link them again here. They’ll use mostly the same ingredients as these pancakes and have a slightly different chocolate glaze. And as always, if you try any of my recipes, I want to see your re-creations on Instagram. It lets me know you’re putting healthy recipes into action, and I love sharing your recipes to inspire others. P.S. If you can’t tell, I’m passionate about low calorie sweets and chocolate-themed recipes. That’s why I put together a free cookbook just for chocolate lovers. You can learn more about it here or enter your info below to download it for free. Enjoy! Would it turn out ok if I leave out the graham cracker crumbs? I wouldn’t recommend it since it’s a full 1/2 cup and is a large part of the s’mores component in this recipe. Sorry!